All Probe Styles are designed in accordance with Chapter 7 Section 2 Third Edition, May 2018. 1/4” Probe (Shown with Optional Brass Weight) (QTR) - Provides the fastest temperature response & Best Accuracy as well as versatility. Easiest to clean. Additional weight sizes exist to accommodate the various needs our industry faces. This probe style is the default probe for the Cabled Tulsa Walker Ranger™. Asphalt Probe (HW) - This is an extra heavy probe for use in dense liquids. It allows the thermometer probe to penetrate easily to the desired level or push through a baffle. To order this option, add “HW” to the model ordered (ie, 6920175LTHW). It works on ALL Walker digital thermometers. Note: Do not aggressively wipe any probe down while it is still hot as it is possible to stretch the cable and damage the probe (When it is “hot, +300°). The Standard 3/4” Probe (SP) - This probe has weight 3/4 lbs. The 1/8” element is protected by a cage. Heavy Weight Cage as seen to the left can be add to this probe later or at the time of purchase. This Probe Style is the default probe style for the Mark IIs, and previous generation Isotherms (Mark II). Its the base variant (ie, 69175). It works on ALL Walker digital thermometers. Extended Probe - This model has a 6-inch probe tip, which is ideal for thermowell measurements, or narrow openings. Specifications and operation are identical to the standard probe tip. To order this option add “EP” to the model ordered, (i.e. 69635LTEP) This works on ALL Walker digital thermometers. 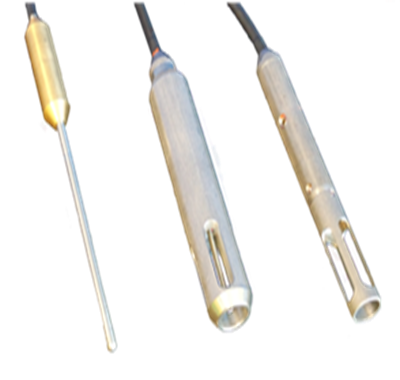 Thin-Line Probe (TL) - This is a 1/2 inch diameter probe made for narrow openings. It is made of brass and has a removable probe cage. Specifications and operation are identical to the standard probe tip. To order this option, add ‘TL’ to the model ordered (i.e. 69175LTTL). This probe works on ALL Walker digital thermometers. Custom Probe - options are available along with several other styles Inquire with us to find out what we can do to make your next PET the best, longest lasting and most accurate device in the field.